This easy to make buttermilk pancake recipe is absolutely fabulous! The buttermilk adds a bit of tartness to the pancake that works really well with your favorite syrup. Stir the dry ingredients into a large bowl. Beat the eggs until they are light and fluffy. Stir the buttermilk into the eggs. Fold this into the dry ingredients and mix until smooth. Add the melted butter and stir well. Heat your skillet or griddle until it is quite hot. Add a little fat, and when it is melted, pour off any excess. Cook the pancakes (1/2 cup batter per pancake) until golden on each side. Keep the pancakes warm in a low oven while you cook up the rest of them. These pancakes are wonderful served with a bit of butter and your favorite syrup. Makes 8 – 10 pancakes. Add a few tablespoons of sugar if you want a sweeter pancake, but you will probably find it isn’t necessary. For extra nutrition and taste, add fresh blueberries, chopped walnuts or slices of banana to the batter. Top the pancakes with a mix of fresh seasonal berries. The buttermilk not only adds fantastic taste to the pancakes. It also makes the pancakes very tender. A good homemade pancake recipe like this one makes it easy to create great restaurant style breakfasts right in your own kitchen. Making something from scratch, like this pancake recipe, is always healthier than a boxed mix. You know exactly what is in the recipe and there are no preservatives or fillers. If you like it, I’d love you to Pin it to Pinterest, Tweet about it, Like it on Facebook and leave a comment and a recipe to share below. This buttermilk pancake recipe is just one of our delicious brunch and breakfast recipes. Find the entire collection here. 10 minutes. That’s all it will take this Pancake Day to impress your nearest and dearest with this mouth watering pancake recipe. 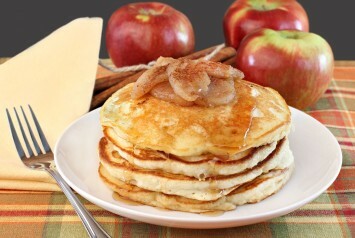 The recipe, created by food brand Merchant Gourmet, is easy to follow and makes a stack of ten fluffy pancakes. So, before you reach for the trusty lemon juice, why not try a delicious new twist on this traditional favourite? 3. Heat a teaspoon of oil or a small knob of butter in a large non-stick frying pan. Drop a large tablespoon full of the batter into the pan to make pancakes about 7.5cm across. 4. Make three or four pancakes at a time. Cook for about 3 minutes over a medium heat until small bubbles appear on the surface of each pancake and then turn and cook for another 2-3 minutes until golden. 5. Cover with kitchen paper to keep warm while you use the rest of the batter. 6. Stack the pancakes to form a pile, drizzle with warm Caramel Toffee and scatter with fresh raspberries.